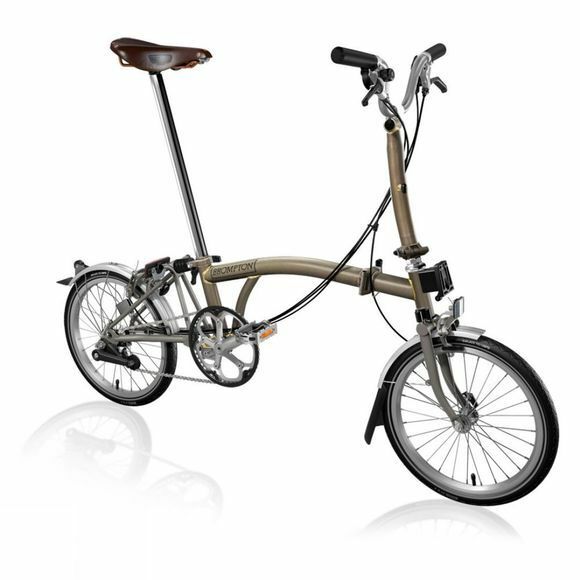 Designed for streetwise urban cyclists and commuters, the Brompton M6LX Titanium 2017 with special edition Brooks saddle features a frame specially designed with lightweight titanium rear frame, front fork and folding pedal bolt, helping to cut down on weight for a faster ride. Perfect for your commute, the Brompton’s frame and handlebars fold down quickly in under 20 seconds, unfolding just as easily. Once folded, the bike is compact and easy to carry, with the chain and gears kept safely inside the design and away from clothing and luggage. Featuring a new M-type handlebar in a classic shape to promote good all round positioning, this Brompton model is equipped with 6-speed gears (ideal for touring and challenging inclines) and new ergonomic underbar shifters. Excellent frame rigidity, firm suspension and an extended seatpost ensure that the energy you put in is efficiently converted into a responsive, quick ride. In all, it adds up to a quality bike for everyday convenience and performance.